The recently-enacted Frank LoBiondo Coast Guard Authorization Act of 2018 included a number of provisions impacting the maritime community. The most comprehensive impact involved major changes to the ballast water management system (BWMS) requirements, which I addressed in a previous article. This article will address other provisions of interest in the Act. provision (46 USC § The period of validity of certifcates of It also requires to Comptroller General entering the water from vessels, but 3305(d)) was enacted to documentation for recreational vessels to conduct an audit to the USCG process there is always room for improvement, improve the consistency in and for renewal thereof has been extend- for issuance of letter of determination particularly after 25 years. Coast Guard to provide persons afected and operation of a land-based, resilient, Comptroller General to conduct a com- bag as an alternative for one additional by a decision or action by an OCMI or and reliable alternative timing system prehensive review of the processes and throwable personal fotation devise on the Marine Safety Center all information to that currently provided by GPS (49 resources used by the Coast Guard to rafts that are 16 feet or more overall in necessary for such person to exercise USC 312). The system must provide implement vessel response plan (VRP) length (Section 827). 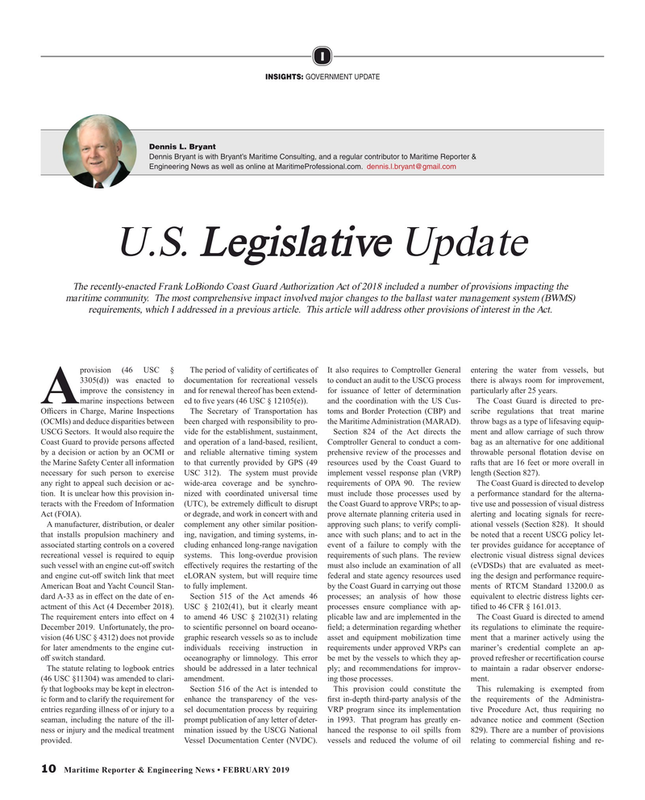 American Boat and Yacht Council Stan- to fully implement. by the Coast Guard in carrying out those ments of RTCM Standard 13200.0 as dard A-33 as in efect on the date of en- Section 515 of the Act amends 46 processes; an analysis of how those equivalent to electric distress lights cer- actment of this Act (4 December 2018). USC § 2102(41), but it clearly meant processes ensure compliance with ap- tifed to 46 CFR § 161.013.